The years following WW2 saw an awakening of interest for European style sports cars in the United States of America. This interest was stimulated by circuit racing using imported cars from England, France and Italy. Most of these machines returned to the States with American servicemen. This type of racing was new to the Americans, who only had experience of Indianapolis and Stock Car racing. In the late 40s and early 50s all types of cars were raced in this category from MGs to Ferraris. Many Americans built hybrids using European chassis or home-built specials, powered by large, slow revving saloon car V8 engines. Among this fraternity was one Briggs Cunningham, multi-millionaire and international sportsman, who built several specials and realised that he could compete with the best of the imports. Taking part in these short circuit races was not enough for Cunningham, who wished to build and race his own cars, preferably all-American in order to beat the best that Europe could offer. In order to prove that the USA could build such a machine, Cunningham recognised the need to race the opposition on their own ground. 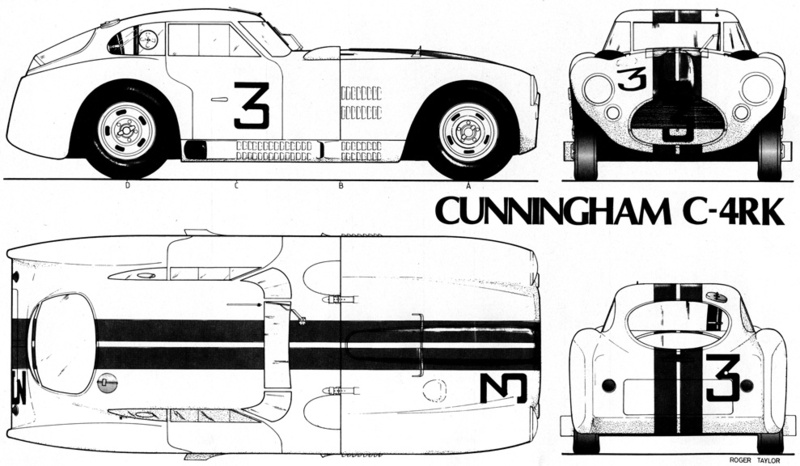 In 1950 Briggs Cunningham chose the battlefield - Le Mans. The two cars entered by the American for the 1950 race were not the standard Le Mans style Sports Car. Both were Series 61 Cadillacs, one with standard saloon bodywork and the other with the bulky rectangular single curvature body nicknamed "Le Monstre". The cars finished in 10th and 11th places and Cunningham had gained an insight into European race procedure. Cunningham's main aim now was to produce a sports car that would outperform and out-sell European upmarket sports cars and 1951 saw the appearance of the production based C2. Three cars entered and all cars were involved in accidents, although one struggled on to finish in 18th position. From his Le Mans experience, Cunningham was now convinced that with a properly designed sports racing chassis powered by the low revving, but reliable American V8 engines, he had a combination capable of conquering the highly stressed European entrants over the 24 hours of the endurance race. The C-4R is the most famous of the Cunningham designs. The very strong welded tubular frame chassis supported the car's bodywork, and the suspension was by wishbones and coil springs at the front with a coil spring supported de Dion axle at the rear. The brakes were enormous, finned drums, 13 ins in diameter, and were necessary to slow down the speed of these overweight machines. The heart of the C-4R was the Chrysler Fire Power V8 of 5.420cc. Four Zenith carburettors replaced the standard single Carter unit which pushed the power up from a modest 180 to 300 bhp at 5,200 rpm. A three-speed gearbox was specially designed for the car to enable the drivers to use all the available power. fitted over the passenger seat on most occasions. A small curved screen on the scuttle afforded the driver a little protection. The huge radiator and airscoops on the bonnet ruined any aerodynamic qualities the car may have had and the aircraft type aircooler sticking out in the airstream did little to improve the appearance of these very distinctive machines. The other entry was a Kammback coupe designed by the legendary aerodynamicist Dr Wunnibald Kamm. The proportions of these beasts were not drawn to please the purist. The low roof line and truncated tail seemed to unbalance the overall appearance, while the slit screen was a throw-back to the 20s. Neither type of body was beautiful, but there was no doubt as to their purpose. The cars were always finished in American Racing Colours, white with two broad blue stripes running fore and aft. 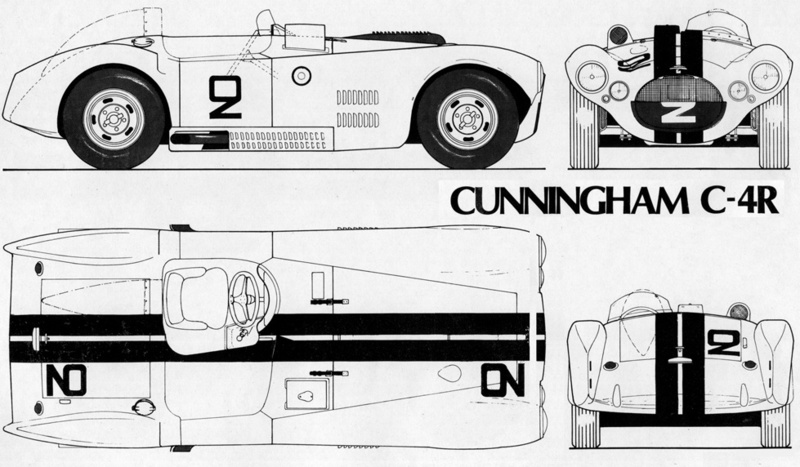 For the following three years the Cunningham team headed the grid at Le Mans. Practice had revealed brake and transmission problems, but they were still able to lead the early stages of the '52 race. Briggs Cunningham who drove for over 18 hours managed' to bring one car home in 4th place. The World Sports Car Championship started in 1953 and the first round, the Sebring 12 hours, was held in the USA. Walters and Fitch drove the single Cunningham C-4R to victory to gain a place in history gaining America its first international road race result. After the success of Sebring the Cunninghams arrived at Le Mans full of confidence. Three cars were entered, one each of the Roadster and Coupe and the unconventional C-5R with rigid axles front and rear, 17ins drum brakes and four-speed transmission. This new C5 finished in 3rd place only 42 miles behind the winner with the others 7th and 10th recording a 100% finish. The Cunninghams were beaten by the disc brakes of the C type Jaguars, who also defeated the remaining Europeans too. For 1954, Cunningham returned to Le Mans with two C-4Rs and a highly modified Ferrari 4.5 litre. This new machine did not really figure in the race and dropped out after 190 laps. The C-4Rs were quite outclassed for speed by the flying Ferrari and D-type Jaguar works entries, but as the appalling weather conditions took their toll, the Cunninghams gained places until the end of the 24 hours. One was third, driven by Spear and Johnson, 156 miles behind the winning Ferrari, while Cunningham and Bennet finished fifth. The 1954 season proved to be Briggs Cunningham's swan song in Europe. He financed the building of a further car powered by an Offenhauser Indy engine and although more sophisticated than the C-4Rs, it did not achieve any results. Cunningham entered various Jaguars and Masera­tis at Le Mans through until 1963 when he finally gave up his ambition. Although Briggs Cunningham never achieved his primary ambition, his cars played a big part in the re-emergence of motor sport in post war years and he pioneered the generation of American drivers and teams that have followed in his footsteps.